Thanks to evolving hydraulic fracturing and horizontal drilling technologies, the U.S. shale revolution that has taken flight since 2008 has transformed energy markets around the world. Long thought to have peaked in 1970, U.S. crude oil production continues to surge to new heights. Higher prices have increased profit margins, and output in 2018 has increased every week so far except one in mid-February. In fact, new crude production has come so fast this year that even the top experts have quickly been shown to be out of touch. Back in November, for instance, analysts at Morgan Stanley claimed it highly unlikely that U.S. shale could add 1 million b/d of supply in 2018. So far, however, production has actually increased 1.4 million b/d, reaching another record of 10.9 million b/d for the week ending June 8. Constant technological and efficiency gains have laid the foundation for soaring U.S. oil production. One of the key advantages of the commodity price collapse that began in 2014 is how “lean and mean” it forced the U.S. oil industry to become. Sunken prices pushed those companies that were not able to cut costs out of business, with over 100 E&P companies going bankrupt by the end of summer 2016. Today, producers have streamlined operations to such a degree that they can “be in the black” even when oil costs just $44 per barrel, or a hefty 33 percent below where prices are now. Capital discipline has firmly been installed: Most companies are not approving projects that cannot generate a 15 percent return even if prices plummet to below $50. We have six or seven major shale plays, but the Permian basin in west Texas has replaced the Bakken in North Dakota as the driving force behind our production boom. Almost doubling since 2015, Permian output is now at ~3.3 million b/d, and the field holds over half of all U.S. oil-directed rigs. Although constraints on pipeline takeaway capacity are raising concerns of a slowdown, IHS Markit still expects the Permian to soar to 5.4 million b/d by 2022. Outside the Permian, the higher prices that we have seen this year — U.S. oil prices hit a four-year high on May 22 of over $72 — have put the other fields more in play, such as the Bakken, offshore, and even a potential resurgence in the Austin Chalk. 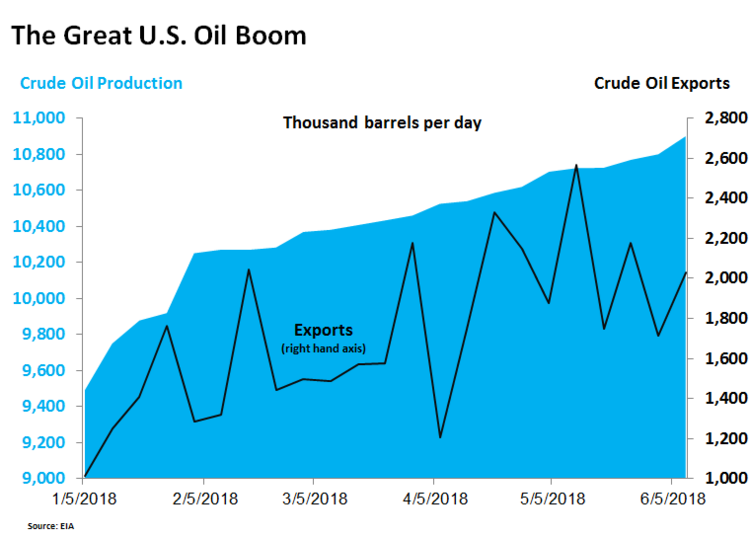 Rising U.S. crude production has also ignited an export business that has been ramping up since late 2015, when a law change made it possible to ship crude to other nations besides Canada. In particular, flat U.S. demand for the past decade and a refining system largely configured to process the heavier crudes that we import from Canada, Mexico, and Venezuela have freed up loads of our oil for other countries. (U.S. shale oil is a lighter, sweeter grade that is not a perfect match for our refineries.) Commercially, U.S. crude exporters have also been bolstered by a widening gap between our own grade (West Texas Intermediate) and the higher cost international benchmark (Brent). It is noteworthy that U.S. petroleum product exports have also been at record highs, with distillate fuel oil leading the way. U.S. crude oil production and exports have surged to record highs in 2018. Looking forward, the future remains very bright for the U.S. oil business. Our Energy Information Administration (EIA) has us racing toward 12 million b/d by the end of next year to easily surpass Russia as the world’s largest petroleum producer. The Paris-based International Energy Agency has the U.S. accounting for 75 percent of new non-OPEC supply this year and next. Our crude exports could reach 5 million b/d over the next five years — more oil than any OPEC nation besides Saudi Arabia currently produces in total. The great American shale boom offers a number of lessons for us. But let me focus on just two. First, we should never underestimate the non-stop advance of energy technologies, even for the conventional sources that many assume will just simply cede the future to renewables. It regularly gets forgotten that while it is indeed true that wind and solar energy will continue to evolve, so wil oil and natural gas technologies. To illustrate, EIA’s International Energy Outlook 2007 never even mentioned shale as a possible future source of oil (or natural gas) in the decades ahead — forecasted out until 2035. In the years since, however, the U.S. shale boom has become the most important energy development globally in at least the past 50 years. Secondly, as OPEC readies to meet with Russia and other partners on Friday to discuss next steps in their November 2016 agreement to cut production by 1.8 million b/d, the U.S. shale story also demonstrates how quickly policy support for our oil industry can allow the country to flourish. Besides the obvious economic and job benefits, our exports have also helped weaken the geopolitical influence of risky OPEC and Russia. For example, since U.S. exports started in 2016, import-hungry China has been our second largest crude customer, receiving 122 million barrels as of March — a $1 billion monthly boon for us. But unfortunately now, the Trump administration’s burgeoning trade war on potentially hundreds of billions of dollars of Chinese goods is being met by very predictable retaliation: China proposing a 25 percent tariff on U.S. crude oil. A loss for us but a gift for OPEC and Russia. Jude Clemente is the Editor at RealClear Energy.